What is ROFL in Internet Slang? 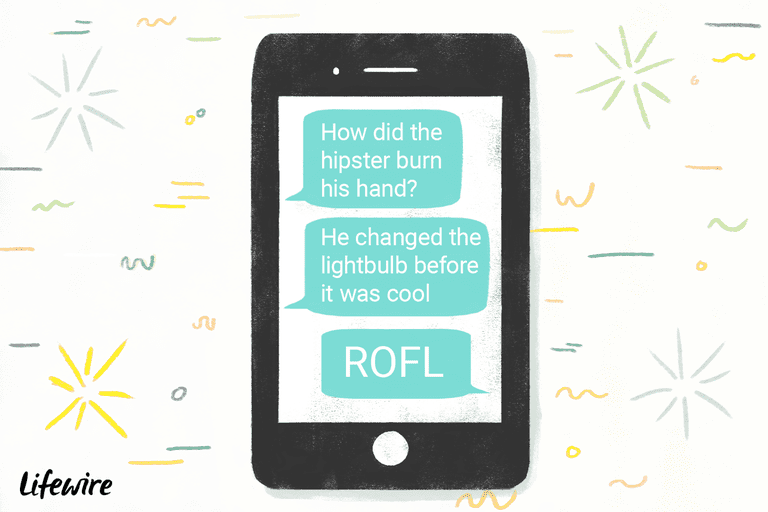 What is ROFL in Texting/Messaging? 'ROFL' is often spelled all uppercase, but can also be spelled 'rofl'. Both versions mean the same thing. Just be careful not to type entire sentences in uppercase, as that is considered rude shouting. (first user:) Oh, man, my boss just came to my cubicle. I was so embarrassed for him because his fly was open, and I didn't have the courage to tell him. (first user:) OMG! You guys just made me spit coffee all over my keyboard and monitor! (second user:) PMSL @ Jim! Bwahahahaha!. (third user:) ROFL! Never put anything in your mouth when Greg is telling stories about his camping trips! (first user:) I have a joke for you! Mother Hubbard went to the cupboard to get her daughter a dress. But when she got there the cupboard was bare and so was her daughter I guess. (first user:) Did you hear about the new corduroy pillows? They’re making headlines everywhere! ROFL is believed to have spawned from LOL and its variant LMAO expression. LOL is a longtime expression that predates the World Wide Web. Even before the first web pages of 1989, LOL was found on early Internet sites in UseNet and Telnet. According to at least one user, LOL made its first appearance in the early 1980's on a BBS (bullet board system) internet site called 'Viewline'. This BBS was out of Calgary, Alberta, Canada, and the user who created LOL is claimed to be Wayne Pearson. The ROFL expression, like LOL, LMAO, PMSL, and many other online expressions and web lingo, is part of online conversation culture. Unusual and customized language is a way for people to build more cultural identity through speech and playful conversation.